I cut out yellow designer paper and matted on black cardstock. I cut a small black border and added Cheery Lynn mini fanciful flourish to bring out the yellow color on the black. I die cut the memory box loving hearts arch on black cardstock. Then placed in on the yellow designer background paper. Added some embellishments around the arch, added flower on black border. Finish off with the Elizabeth Craft sentiment Love sentiment in the corner. So perfect that anniversary or just because. Lovely, Berni! I especially like the yellow and black combination. So striking! 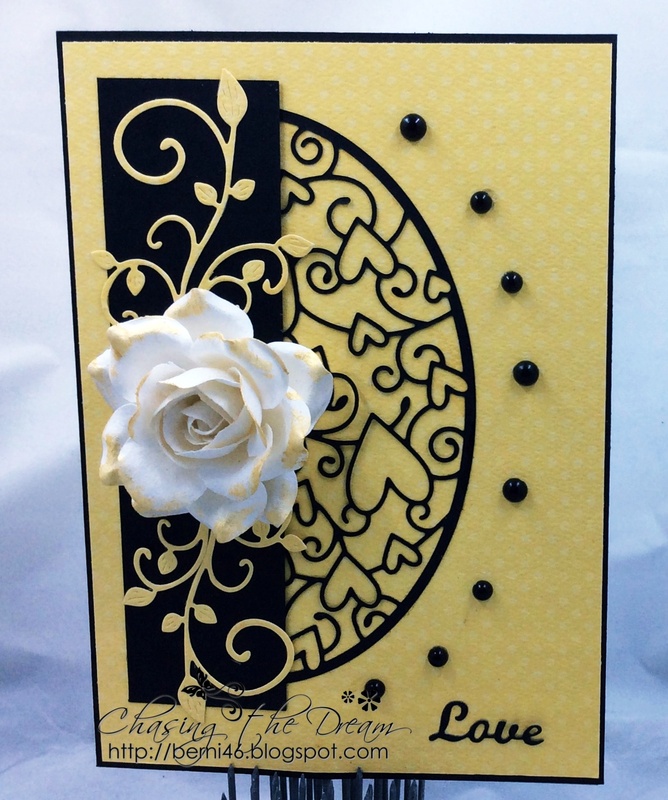 Stunning card, I too love yellow and black together! Love the pretty die cut in black against the yellow background, it all just POPS! I think your pearls accentuate the curve of the die beautifully..........gorgeous card Berni. Wow Berni, this is stunning! I second what everyone else has said about this beautiful card. The pearls are a perfect finishing touch and everything pops! Berni, this card is amazing!!! Love how you layout everything!! Sorry for being MIA, My MAC is acting like a PC and giving me lots of problems. Anyways, thank you ladies.